By now you know that I love fall for the changing colors of the leaves. Red, orange, yellow...I like them all. But all good things come to an end and soon those leaves I admire so much will be on the ground waiting for me to rake them up. And you should rake leaves so you can help prevent accidents and prevent storm drains from clogging. Nothing good comes without a cost. So what do you do with these leaves? From November 2 to January 9 the Department of Public Works (DPW) will collect them for you. There are two options for collection. Rake the leaves into piles in the curbside treebox space. These leaves will be collected by a vacuum truck and composted. District residents can then request compost between March and October by calling 311. Bag the leaves and place them in either the treebox space or alley in neighborhoods with rear trash and recycling collections. Be sure to put the bags next to the recycling containers. These leaves go straight to the landfill. No composting, no recycling. Sad face. Before you rake, learn when leaf collection is schedule for your neighborhood. I've even made it easy for you. 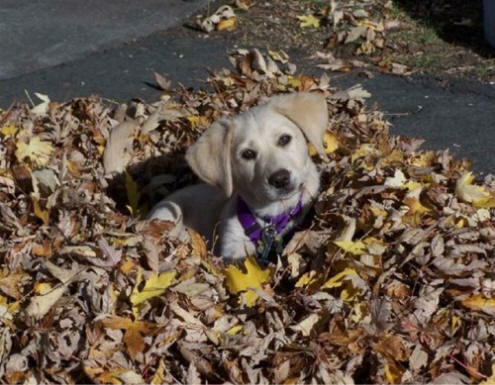 Click here or the adorable puppy above for the 2009-2010 Leaf Collection Schedule.